Yo! Due to the current heatwave in San Diego, we stream live from Rocco's air conditioned living room on his PS4! Watch as we cover Apples keynote, the iPhone6, talk about Destiny, and eat gross pizza! Plus, get ready for the "Tim Tam Incident." Listen to the *high quality audio here! 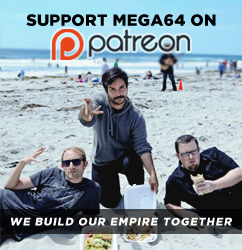 Before you go, check out our Mega64 Store! We just restocked the "Digital Surfer" and the "L Block Shirt!"